The Last Great American Magic by L.C. Fiore is an epic tale of war and magic, featuring very interesting characters, powerful themes, and a classic conflict, a story that paints an exotic landscape with a unique culture in the tradition of The Last of the Mohicans. Two brothers, one a prophet and the other a warrior, reconcile their childhood grievances and work together to protect a culture threatened by post-colonial wars. Spiced with a love story between the warrior and a beautiful hostage, this story is packed with breathtaking action and surprising twists that make the read hugely irresistible. L.C. Fiore is a master craftsman when it comes to characters and plot. Fast-paced and intriguing, the plot has many "Aha!" moments. The story begins with action and the evocation of powerful and interesting images: the warrior, Tecumseh, shot and languishing alone in pain, the forest, and the solitude, and then the practiced, sharp sense of hearing culling the sounds around him. The reader is immediately thrust into a powerful canvas of war and the chaos it creates. But the focus on the plight of the warrior is something that creates a driving sense of curiosity in the reader who wants to know if the warrior will survive and what will happen if he does. The language has a spell of its own, beautiful and utterly descriptive with a sensuality that transports readers into untraveled terrains. The Last Great American Magic is a captivating story, a hard-to-put-down tale of courage, nerve, and love from a master storyteller. The Last Great American Magic by L.C. Fiore is part historical fiction, part magical realism, part coming of age, set in the late eighteenth century. It re-imagines the life of Tecumseh, a legendary Shawnee warrior, and his brother, Rattle, gifted with prophetic powers. Together they hope to form a confederacy of Native American tribes and to drive out the invading white settlers for good. Starting in the midst of a battle in the wilds of Canada, Tecumseh has been shot and is close to death. As he is reflecting on his life, we're taken back to his childhood where he is the eldest in a set of triplets. With a name that destines him for greatness, he has to come to terms with that, as well as carrying the burden of taking care of his brothers who struggle to determine their own fates. While I had heard of the name Tecumseh, I have never actually read about the man himself and reading L.C. Fiore's latest novel excited quite a lot of my interest. I found myself curious about his life and goals and how closely they lined up with The Last Great American Magic, especially in relation to Tecumseh's brothers who, throughout the novel, felt more like literary archetypes than fully fleshed and well rounded people. Still, The Last Great American Magic is an ambitious novel, with an overarching theme of brotherhood, from Tecumseh and his brother, Rattle, to the Shawnee and neighboring tribes, to the Native Americans and the white settlers. Fiore tries not to follow the easy route with his theme and for the most part manages to succeed, while at the same time bringing to life a wilder period in American history. Good for any reader interested in Tecumseh and who doesn't mind a dash of magical realism mixed with historical fiction. The Last Great American Magic by L.C. Fiore revolves around the legendary Shawnee warrior, Tecumseh, who was not only gifted, but was also groomed from day one to lead. Shawnee Indians are a religious tribe in the lush river valley of Ohio and Tecumseh's twin brother, Rattle, also had supernatural gifts. They put aside their rivalry and reconcile, hoping to drive the white settlers out of the place where they once lived. With his spirit guide and brother, Tecumseh takes readers along with him on his journey of finding his mission and purpose in life. And amidst all this, he falls in love with his beautiful white hostage. Will Tecumseh and Rattle succeed in their mission? The book is a compelling read with suspense, history, and action. The characters are strongly well portrayed and they leave lasting impressions in the minds of readers. The author's fluidity in expressing and narrating the scenes gives a good pace and movement to the plot, making the book engaging and entertaining. The story is colorful and vibrant and the historical angle makes it memorable. The story is profound and insightful and shows Tecumseh effectively, highlighting him as a warrior in the eyes of readers. The romantic angle gives the plot a new twist from the action. For all those who already know the story of Tecumseh, reading this book will make them relive the war and take them on an exciting journey into the past. L.C. Fiore’s The Last Great American Magic provides an imaginary glimpse into the life of the infamous Shawnee warrior Tecumseh. It chronicles the family tragedies and complex relationships in the life of Tecumseh … the loss of his father at an early age, the competition and conflict among his triplet siblings, and the expectations of leadership that were thrust upon him at an early age. This well-researched novel reveals the early struggles of the Shawnee people during the days of the American Revolution. It helps readers understand the personality of Tecumseh, a complex man molded by a lifetime of conflict and warfare. And it explains his desire and frustrating efforts, in the days leading up to the War of 1812, to form a vast confederation of native peoples that might somehow dislodge the white man from the Americas once and for all. I loved this story. Loved it. I couldn’t close the Kindle app on my phone. I read it at work, in restaurants, while waiting at the mechanic … I simply couldn’t put it down. I was captivated by this imaginative, colorful, and creative novel. This portrayal of Tecumseh is far from the bland descriptions that I have read in encyclopedias and textbooks. It illustrated the inner conflicts and sometimes wavering confidence of a legendary strong native man. His relationship with his triplet brother, Rattle, is particularly intriguing and, in the end, tragic. Fiore managed to portray a Shawnee world in such a way that it seemed as if he had lived among the people. His colorful references to very realistic sights and smells almost climb off the page and bring that lost world to life in the mind of the reader. True to its title and as expected, native magic and shamanism play a key role in the story line. The vibrancy of the various visions, spirit leaders, and wraiths brings a unique level of complexity to both the story and the dialog. The love story and its accompanying sexual encounters were a bit more vivid than I anticipated, but added yet another level of realism and vulnerability to the character of Tecumseh. This is a five-star effort, no doubt. I’ll recommend it enthusiastically to my historical fiction friends. The lifestyle of the Native American tribes changed quickly and dramatically as settlers moved further into the country, looking for farming and grazing lands. Tecumseh was one of the last leaders of his people to try to prevent the loss of their heritage and The Last Great American Magic unapologetically tells his story as he grows into manhood, trying to hold his tribe together and maintain what he felt their creator had planned for them. Suffering one type of hardship after another, Tecumseh struggles to uphold the values taught to him by his father as he deals with changing political conditions and unsettled family dynamics. With a fun-loving spirit guide and a strong connection to nature, Tecumseh remains steadfast in his determination not to submit to the will of the American politicians. Using his reputation for fearlessness in battle, Tecumseh travels the central part of the growing US to rally other tribes to fight for their freedom. Unfortunately, he begins to see that the magic once held by his people has faded and become impotent in the face of the westward push of settlers. How Tecumseh chooses to live out his life confronted by these changes is a testament to the strength of his beliefs. L.C. 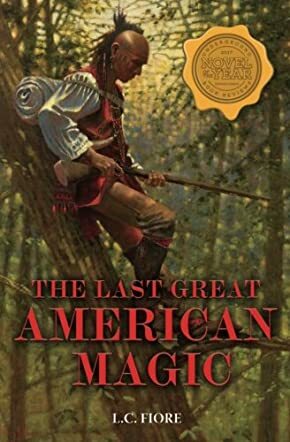 Fiore has masterfully depicted the majesty and mystery of Native American life in Colonial America in this spellbinding novel, The Last Great American Magic. It is easy to feel the strength of the Spirit and its connection with nature as the characters follow their long-held beliefs, even as this way of life is slowly pushed to adapt to new forces outside of the people’s control. This is truly historical fiction at its best. An excellent story told with great empathy and reverence. I can't wait for another LC Fiore after I've finished his latest...he always leaves me satisfied but wanting more! Patiently I wait and I'm always enriched. THANK YOU!